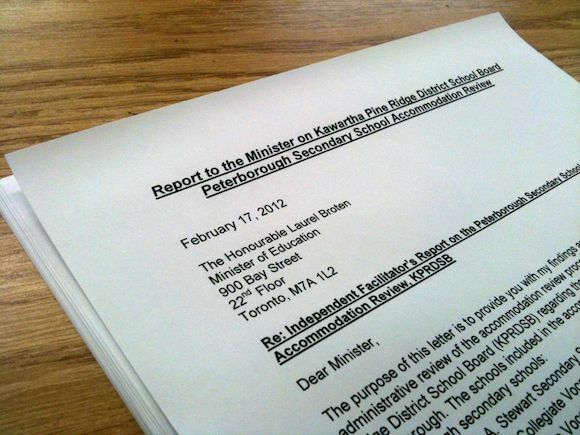 The Report to the Minister on Kawartha Pine Ridge District School Board's review process can be now found online. Facilitator Joan Green does not recommend the review be redone. According to a release, "Although Green does not recommend that the board redo the accommodation review, she recommends that the Kawartha Pine Ridge District School Board strengthen its policy to support more deliberative accommodation review processes in the future. Green also expresses confidence that secondary schools and students in the City of Peterborough will be well served with the excellent facilities and programming being planned." In a nutshell, she says the board did its job. More coverage here.